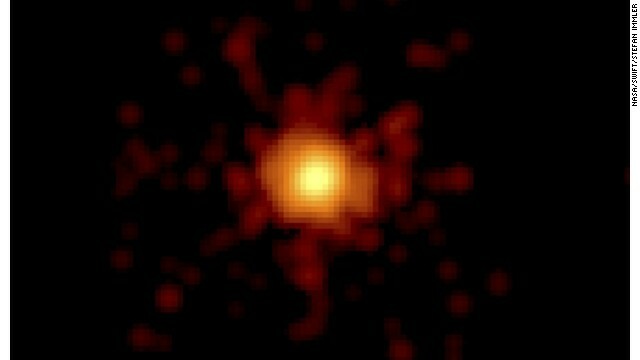 An X-ray telescope image of GRB130427A. On April 27, NASA's Fermi and Swift satellites detected a strong signal from the brightest gamma-ray burst in decades. Because this was relatively close, it was thousands of times brighter than the typical gamma-ray bursts that are seen by Swift every few days. Scientists are now scrambling to learn more. We already knew that when the biggest stars run out of fuel, they don't fade quietly away. Instead, they explode in a blaze of glory known as a supernova. These stellar explosions are often bright enough to be seen by us even though they are in galaxies billions of light-years from our own Milky Way galaxy home. In very rare cases - such as GRB130427A (tagged with the date of its discovery) - astrophysicists are lucky enough to see energetic gamma-rays from hyperfast jets of outflowing material consisting of charged particles created during a massive star's violent death throes.